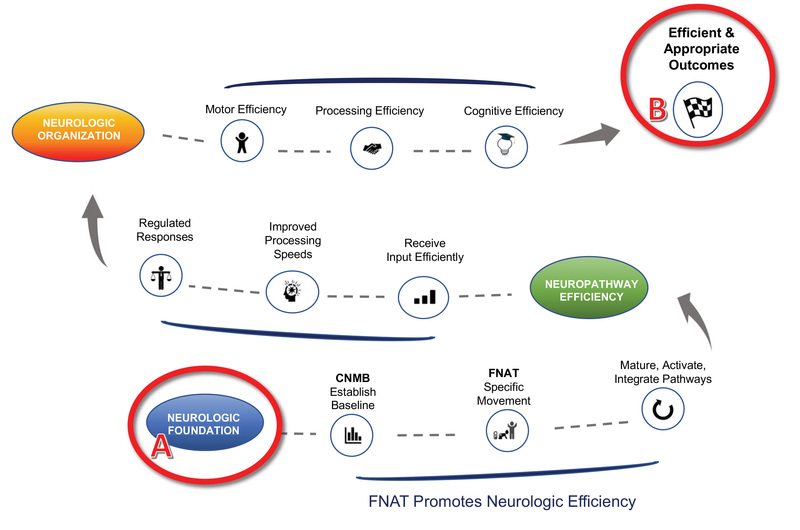 FNAT is a unique, non-medical approach to address the foundational element of neuropathway efficiency. Our proprietary combination of movement sequences based on the neurobiological process of brain development improves how the brain receives, and processing information. Increased neuropathway efficiency leads to improved motor, processing, and cognitive function. In-depth assessment utilizing the Costello Neuro-Motor Blueprint which enables us to establish program that meets your needs. The assessment covers 7 dynamic areas of brain function that we share and discuss with you. Initial Program Length 24 sessions with 2 sessions per week. Extension programs determined by the results of your re-assessments. Generally, programs are completed in approximately 3 to 6 months time, with some individuals needing more time to achieve their goals. In-Center sessions consist of one hour, two times a week. Each hour consists of the FNAT protocol, covering the complete process of neurobiological development every visit. Performance reports are provided at intake, week 5, and week 10 following assessments. The results are emailed to you and reviewed at progress meetings. A follow-up assessment takes place approximately three months after completing the program. The initial assessment can be completed in one hour. Assessments are unique to the FNAT protocol and intended to identify areas of neuro-motor inefficiency. This establishes baseline numbers and a means by which to measure growth during your program. Our program is drug-free. It does not replace medical advice, rather it complements it. We are also happy to collaborate with your other service providers and will schedule time to speak with any practitioners you provide information releases for. Our priority is you!. Our doors, phone lines, and emails are open for communication for any question, concern, or comment no matter how big or small it may seem.